You love eating Montreal-grown food all year long? Perfect! From now until the end of June 2017, all in-store preserve purchases are 25% off. 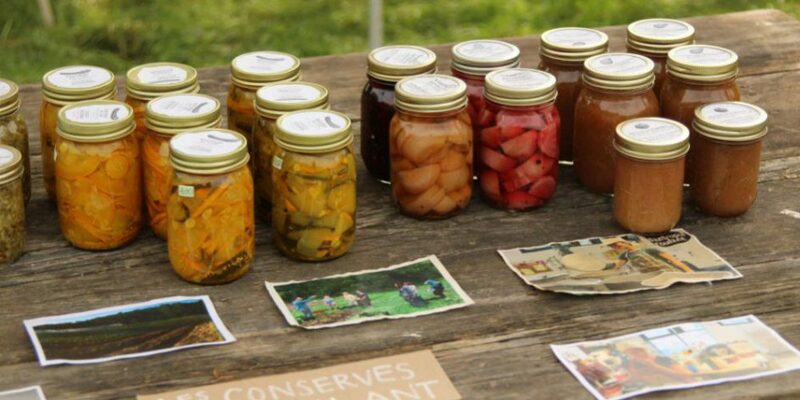 Since a new harvest season will be upon us shortly, we’re eager to make space for new preserves and give back to our community. Come into our General Store at 111 rue Roy and check out the beautiful food in jars lining the shelves. Our opening hours are Monday – Saturday, 9:30 am – 5:15 pm, and Thursday from 12:30 – 9:15 pm. Once you have your selection of preserves, you can apply the 25% discount to the marked price on the jars. For example, for a $8 jar of apple butter, you can simply note $6 when you list your purchase in our self-serve store. All year round, volunteers can choose a price for preserves according to your financial situation, and pay between 50% and 100% of the marked price. Learn more on selecting an appropriate price. Your purchase supports our work! All funds are re-invested to further the Roulant’s mission: bringing people through participation in the food cycle. Have questions? Contact Isabelle, our food preservation coordinator.